Until the end of March, the Putterham Library is host to “Food for Thought: the Origins of Massachusetts Food and Why it Matters”, a travelling exhibit on loan from the Commonwealth Museum. Stephen Kenney, Director of the Commonwealth Museum, will speak about this exhibit on Monday, March 26 at 2:00 p.m.
On Monday, March 26, from 7:00 – 8:30 p.m., join adventurous Mackenzi Lee, author of the Stonewall Book Award Honor winner “The Gentleman’s Guide to Vice and Virtue”, to discuss the too often overlooked ladies of history from her new nonfiction book, “Bygone Badass Broads: 52 Forgotten Women Who Changed the World”. We will debate who to pick for a fictional all-women pirate ship crew, if given the option of women from history and fiction. Who would be your captain, first mate, doctor, or cook? Who might mutiny? Bring your top picks. The Children’s Book Shop will be selling books at the event, held in the Village Library’s Teen Room, and Mackenzi Lee will be signing after the discussion. Supported by a grant from the Brookline Community Foundation and generously sponsored by the Friends and the Trustees of the Public Library of Brookline, there will be a series of free Brookline Eats! events at various locations in town through May 19. Please register for all events at brooklinelibrary.org. Upcoming library events are: Cookie Decorating, Thursday, March 29, 3:00 p.m., BV; Myers+Chang at Home, Saturday, March 31, 2:00 p.m., CC; “Food for Thought” exhibit (described above) on view at CC throughout April; Boston Homebrew Supply, Tuesday, April 4, 6:30 p.m., CC; and Snacks of the World Blind Taste Test, Wednesday, April 4, 3:00 p.m., BV. In honor of Women’s History Month, join us to hear the stories of four women writers on Thursday, March 22, 7:00 – 8:30 p.m., Brookline Village Library. Fiction writer Grace Talusan, journalist Firuzeh Shokooh-Valle, and poets Yara Liceaga-Rojas and Sharon Amuguni will discuss their work – and the challenges and opportunities they have faced in their fields. The panelists will share selections of their writing in multiple languages. Please register for this event online. In honor of Women’s History Month, we will screen one more women-centric movie at the Village Library on Tuesday, March 27 at 6:30 p.m. And we will provide the popcorn! For other films dedicated to Women’s History Month, check out Midday Movies at the Putterham Library and Movie Matinees at the Coolidge Corner Library. Join us at Putterham Library’s Meeting Room, Wednesday, March 28, 6:30 p.m. for a fun adventure playing Dungeons and Dragons Fifth Edition. Dice and snacks will be provided. Use a library character or bring one from the Adventurer’s League. Registration is required. You are invited to Jodie Hollander’s reading of her debut poetry collection, “My Dark Horses” (Liverpool University Press) at the Coolidge Corner Library, Thursday, March 29, 6:00 – 8:00 p.m., alongside the acclaimed poet Robert Mezey, who will be reading new and selected poems. Join us at the Village Library, Wednesday, April 4, 7:00 – 8:30 p.m., for a showing of the powerful and uplifting documentary “Our Mockingbird”. This ground-breaking film relates the experiences of students in two high schools in Birmingham, Alabama, one predominantly black and the other predominantly white, as they come together to put on a play based on the novel “To Kill A Mockingbird”. The filmmaker, Sandra Jaffe, will be on hand to introduce the film and lead a conversation afterward. Doors will open at 6:30 p.m. Please register online. Suzette Abbott of Hidden Brookline will lead a walking tour of local Underground Railroad sites and other landmarks of African-American history in Brookline. The tour begins at Brookline Town Hall, 333 Washington Street, Saturday, April 7, 2:00 p.m. Rain date: Sunday, April 8, 2:00 p.m. Registration required. The Brookline Library Music Association concludes its 66th season Sunday, April 8, when the Videri String Quartet will perform works by these composers: Nakamura, Williams, Haab, Kondo, Borodin, Schyman, Santaolalla, Coker, and Wintory at the Village Library. This concert is free and everyone is welcome though seating is limited in our handicapped-accessible Hunneman Hall. Doors open at 2:00 p.m.; the concert begins at 2:30 p.m.
Join us at the Village Library, Thursday, April 12, 7:00 – 8:30 p.m., for a panel discussion, “The Economic Realities of Racism.” Nancy Gertner, former United States District Judge of the U.S. District Court and Harvard Law School Professor, will moderate. She will be joined by Barry Bluestone, Professor of Political Economy at Northeastern University; Margaret Burnham, Professor of Law and founder of the Civil Rights and Restorative Justice Project at Northeastern University; and Patricia Wen, noted journalist and editor of the Globe’s recent Spotlight Series on racism in Boston. Please register online. Five Team Brookline runners have been training all winter to be ready to run the Boston Marathon on April 16. They are raising money for the Library Foundation’s programs. Encourage their hard work by checking out their individual pages here, and make a donation to bring them closer to their fundraising goals! Cheer for them on April 16, Patriots’ Day and Marathon Day, as they make their way down Beacon Street. 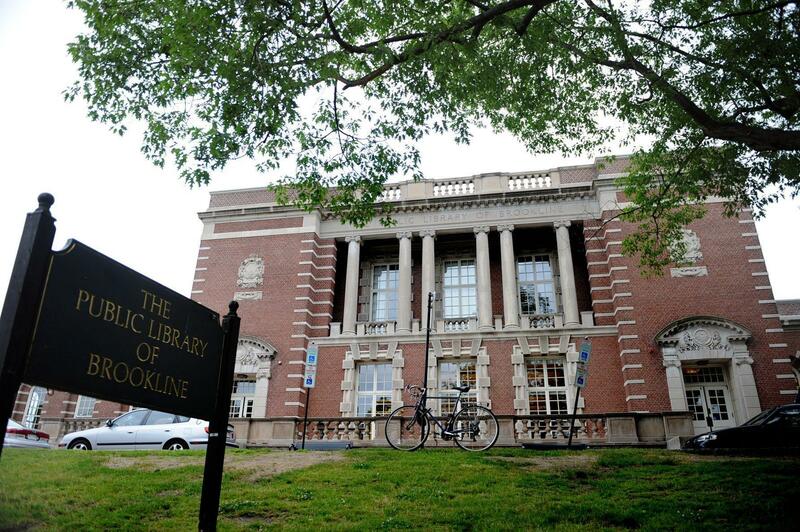 March your calendar: On Saturday, May 5, the Library Foundation is hosting a fun party at the Coolidge Corner Library – just before closing for a brief renovation. We will sip mint juleps, listen to Bluegrass music and watch the 144th running of The Kentucky Derby – all while raising money to support the renovation, and also fund technology at each of our libraries. When we heard that the Coolidge Corner Library would temporarily close for repairs this summer, the Library Foundation offered to contribute additional capital to make significant upgrades for the future. So, get your Derby hats ready and join your friends and neighbors to watch the most exciting two minutes in sports! Help us set the pace early by taking two minutes now to pledge advance support by March 22 and be listed on the invitation. Click on DerbyDay@Coolidge for more information and watch for ticket sales to begin April 1. Last week we highlighted several of the multi-volume book sets the Friends of the Brookline Public Library has for sale at the Brookline Village Book Sale. Most of those were of the literary genre but that is just a portion of our wares. We have sets regarding music, architecture, science, psychology, German, Judaica, and more. And for you historians, here’s a sampling of sets that are available: The American Nation: A History (20 volumes); and Commonwealth History of Massachusetts (six volumes), both edited by A. B. Hart; McMasters’ History of the People of the US (16 volumes); The Colonial Period of American History (CM Andrews, four volumes); and History of the United States (Channing, six volumes). Ready for a personal tour of these and more?! Send an e-mail to: friendsofbrooklinelibrary@gmail.com and we’ll make that happen! BV: Monday, April 2, 7:00 p.m., “Swing Time” by Zadie Smith. BV: Taste of Poetry, Thursday, April 5, noon, Common Threads will be discussed. CC: (Mystery) Monday, April 9, 12:30 p.m., “Everything You Want Me to Be” by Mindy Mejia. BV: Monday, April 9, 2:15 p.m., “Another Brooklyn” by Jacqueline Woodson. BV: (Shelf Respect) Wednesday, April 11, 7:00 p.m., “The Hate U Give” by Leigh Angie Thomas. CC: (New! Let Then Eat Baked Goods and baked goods will be shared!) Thursday, April 12, 6:30 p.m., “Dorie’s Cookies” by Dorie Greenspan. BV: (Mystery) Tuesday, April 17, noon, “The Ice Princess” by Camilla Lackberg. CC: (And the Award Goes to…) Wednesday, April 18, 2:00 p.m., “Underground Railroad” by Colson Whitehead. CC: (Read and Meet), Thursday, April 19, 7:00 p.m., “Refrigerator Monologues” by Catherynne M. Valente. PUTT: (Council on Aging), Monday, April 23, 2:00 p.m., “Underground Railroad” by Colson Whitehead. In the Children’s Room at the Village Library, Izzy Park will display her Beanie Boos and Mei Davis will display her National Park Service patches until April 4. This year, Brookline Open Studios Weekend will be held Saturday, April 28 and Sunday, April 29. Since 1986, Open Studios has been an annual springtime event, held in locations all over Brookline. The Brookline Artists Open Studios Preview Show is on view at the Village Library in the Foundation case and Hunneman Hall through April 22. It features the work of many Brookline artists participating in Brookline Open Studios Weekend. And, for the month of March, Gracie Gamwell, will show her Legos in the display case at the Putterham Library. Brookline Village (BV): Mother Goose on the Loose, 13- to 23-month-olds, Wednesdays, 10:30 a.m. and 11:30 a.m., through April 11. BV: Terrific Twos (and Threes! ), ages 2-3, Tuesdays, 10:30 a.m., through April 10. BV: Storytime (2- to 3-year-olds), Thursdays, 10:30 a.m., through April 12. BV: Storytime (3- to 5-year-olds), Wednesdays, 3:30 p.m., through April 11. BV: Saturday Six to Eights (6- to 8-year-olds), Saturdays, 2:30 p.m., through April 7. BV: Grab Bag Craft, ages 5 and up, Thursdays, 3:00 p.m., through April 12. CC: Come play with us, infants to 12 months, Mondays, 10:15 a.m., through April 9. CC: Lego Club, ages 5 and up, Mondays, 3:00 p.m., through April 9. CC: Mother Goose on the Loose for Ones and Twos, Tuesdays, 10:15 a.m., through April 10. CC: Singalong, Dance, and Play for infants to 5-year-olds, Wednesdays, 10:15 a.m., through April 11 and Saturday, April 7 at 10:30 a.m.
CC: Playspace for ages 2-5, Wednesdays, 11:15 a.m., through April 11; and Fridays, 10 a.m., through April 13. PUTT: Toddler Storytime, 2- to 3-year-olds, Tuesdays, 10:15 a.m., through April 10. PUTT: Preschool Storytime, 3- to 6-year-olds, Tuesdays, 3:30 p.m., through April 10.